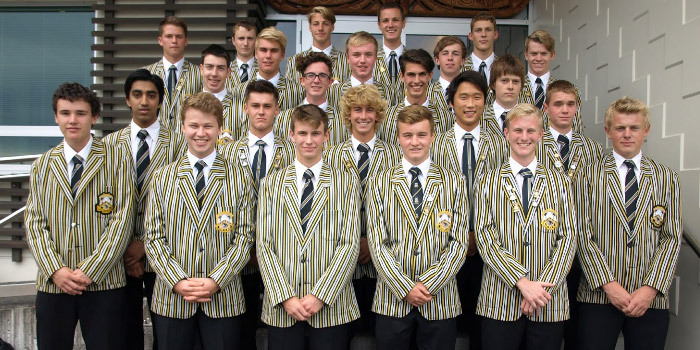 The Tiger Jacket is New Plymouth Boys’ High School premier award for top academic students, performers and sportsmen. First established in the late 1920’s, the distinctive tiger stripes were instigated as a blazer for cricketers, prefects and rugby players. The criteria has expanded over the last eighty years to include a wide range of sports and arts along with top academics. The jacket is only awarded to Year 12 and 13 students who must reach a certain criteria in order to be considered for the honour. They must also satisfy the staff member in charge of the particular area, that they have performed to an excellence level, also has an input into whether the jacket is awarded. Nominations are forwarded to the chairperson of the Awards Committee and before the Committee will consider a nomination, they must obtain clearance from their dean. This is to assess whether the student’s performance in class and around school warrants the awarding of a Tiger Jacket. The criteria for consideration, is a guideline to staff of the minimum standard required before a student can be considered for a Tiger Jacket. It varies between sports and cultural activities and is based around a level of performance and/or the level of participation for each activity. The Awards Committee is chaired by the Director of Students and is made up of the Headmaster and elected staff members. Once a nominee has been confirmed as an awardee of a jacket by the Awards Committee, he will be notified. He is then able to purchase, or hire, a Tiger Jacket from the Uniform Shop. Awardees will then attend a special assembly, to which their parents/caregivers are also invited, where they will be presented with the jacket. Those awarded a Tiger Jacket are also invited, along with their parents/caregivers, to the Annual Awards dinner where the naming of the school’s Dux, Sportman of the Year and Performing Artist takes place. The wearers of Tiger Jackets are expected to “Be the Example” and if, in some circumstances, the awardee is not being the example, the award can be removed by the Awards Committee or the Headmaster. If you have any questions about the Tiger Jacket, you are asked to speak to the Teacher-in-Charge of your discipline or any of the Directors of Students, Sport, or Culture.